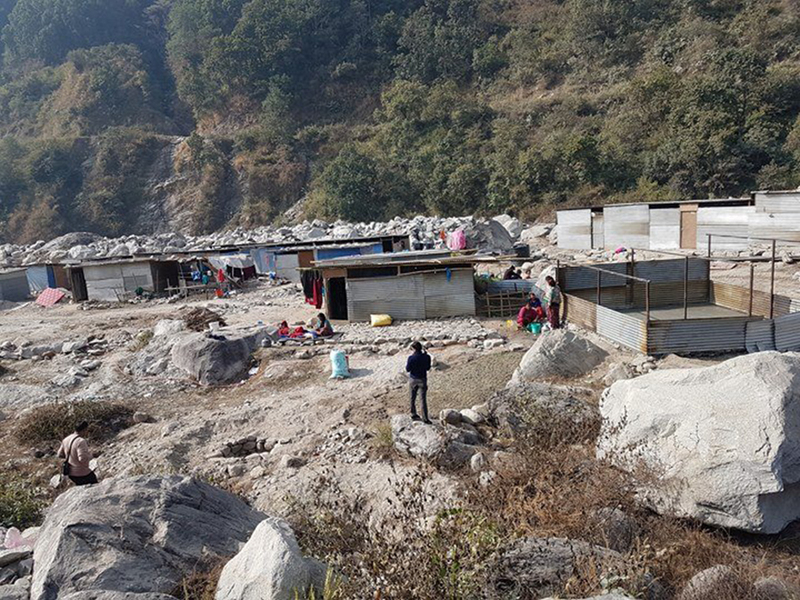 RASUWA, Dec 21: When the devastating earthquake of April 2015 rendered them homeless, dozens of Uttargaya rural municipality residents fled to safer locations. In the immediate aftermath, they erected makeshift house in rented property and started living there. Months passed by, but life did not change. As most of these families did not have regular source of income, to pay the monthly rent for the property, it became increasingly challenging for them. Victims say that even the government's relief packages became elusive to them. Lethargic distribution process of the relief packages, among others, made it difficult for many of them to sustain. Unable to pay the rent, around 150 of these families were evicted from their makeshift home. 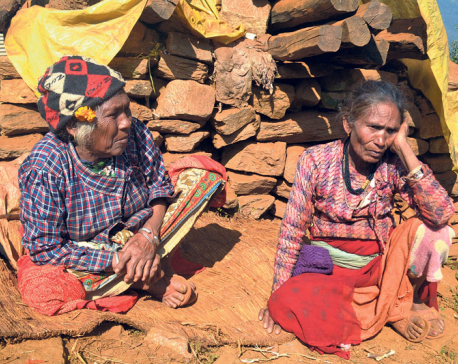 With nowhere to go, these families have taken refuge in Khalte Bagar of the Trishuli River. 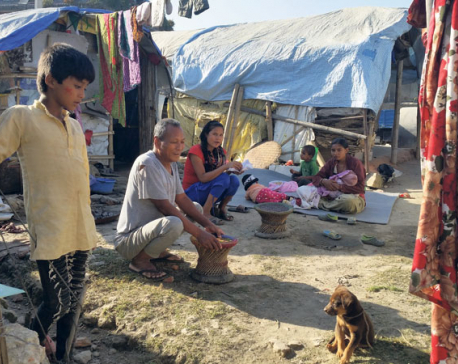 “Earthquake took away everything we had including our house, clothes, utensils, cattle, and land,” lamented Thulimaya Tamang, a resident of Dadagaun. “Since then, fate has only been very cruel,” she added. Tamang's family was living a normal life in the mountains prior to the earthquake. They owned a very small plot of land for farming but its yield would suffice for the family for the year. “We had to work very hard, but it was not difficult to manage two squares meal a day. We were poor but we were happy,” she reminisced. After the quake snatched everything from them, her family had to face multiple problems. Health of the family's members deteriorated. During rainy days and winter, children had to be taken to hospital many times. In lack of proper house to live in and enough diet and proper care, they lived a miserable life. “Along with us, 30 more families are staying on this riverbank. We are still struggling to have our ends meet and I do not know how this will change,” she reported. There are stones and sand all around her hut. Tamang keeps staring at them. “We don't pay anyone for living here and it feels as if it is ours own. But we cannot grow anything here so, if we could get some work it would help our family to sustain,” she said. Getting payable work is a huge concern for all the families living on this riverbank. If they don't get work, they can't buy food for the families. According to Dil Maya Tamang, another woman living with her family on the riverbank, as the town area is far from the settlement, it is not easy for the victims to go and work there every day. “It is crucial that we work and get paid everyday for sustaining but with no work around, it is becoming hard to live,” she said. Families from Naubise, Mailung, Kharku and Berawati among other villages of the Uttargaya rural municipality have been living here. Most areas of this rural municipality were severely damaged by the earthquake. Dil Maya says that the horrible memories of the devastation have not ceased to break down their nerves even nowadays also. “We still have vivid memories of those cracks and falling of the houses, deaths and all. We survived, but life continues to be a big struggle to survive,” Tamang noted. With the temperature dipping down, the increasing chill is further victimizing these families. And, they are now worried about their wellbeing. “One can feel what it means to lose your cozy house and belonging, only if they have been in such a situation,” remarked Jomo Tamang, another quake victim. She stated that the local administration has been neglecting their miseries because they have not gone through what they are going. “If the government had expedited resettlement of victim families like ours, perhaps by now we would have been living in our homes and earning for our families,” Jomo said. The office of the Uttargaya rural municipality is not far away from the Khalte Bagar settlement. However, unlike the victims, the office does not keep the record at its fingertip. Upendra Lamsal, chairperson of the office assumed that there might be over 100 families living at Khalte Bagar. He, however, said that the area where the victims have been living is very prone to floods. “We had warned the families that the area was prone to floods and had suggested them not to stay there. But they settled down there nonetheless,” he said. Lamsal added that geologists have categorized the riverbank as very risky place for human settlement. The riverbank was created around 55 years ago due to flooding in Trishuil River. Though, it has remained the same through the years its base is still fragile, Lamsal said. Upon inquiring what plans his office has for these victim families, Lamsal said that they are discussing possible solutions. “We cannot bring separate program for these victim families right now. For the time being we can only facilitate distribution of the relief provided to them from the government,” he added. Lamsal stated that his office has been discussing the issue and hoped to relocate the victim families to safer location within two years.